Sydney Harbour is the inspiration for many of the major attractions in Sydney. Arguably the next must see destination after the harbour is the beach. Sydney possess Bondi Beach one of the world’s most famous beaches. There are arguably ‘better’ beaches further north. Follow the link below to find out more. Once we have seen enough of Sydney Harbour and considered a visit to the beach what then? Escape it all and head for the hills! The Blue Mountains aren’t technically in Sydney but that is just a technicality so don’t let it put you off. They are just over an hour away and are a must see. 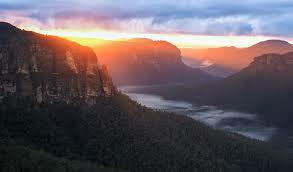 The Blue Mountains are beautiful and majestic and there are many wonderful ways to see and experience them. It can feel like a holiday within a holiday. The Sydney Opera House has to be seen and admired and it is an impressive sight, one of the most recognisable buildings on the planet. There are many ways to enjoy the magnificent Sydney Harbour Bridge. You can climb over it, sail under it or simply walk across it. Find out more from the link below. Depends of course when you find yourself in Sydney but there is always, always something happening. You are bound to find some great must see event taking place while you are here. Beit a festival, musical, exhibition or concert make sure you don’t miss out on tickets. Alternatively register for the monthly Sydney100 newsletter to see what’s on. It can be a wild place Sydney but mostly of the furry variety. Follow the link below for the centres of wildness around town.